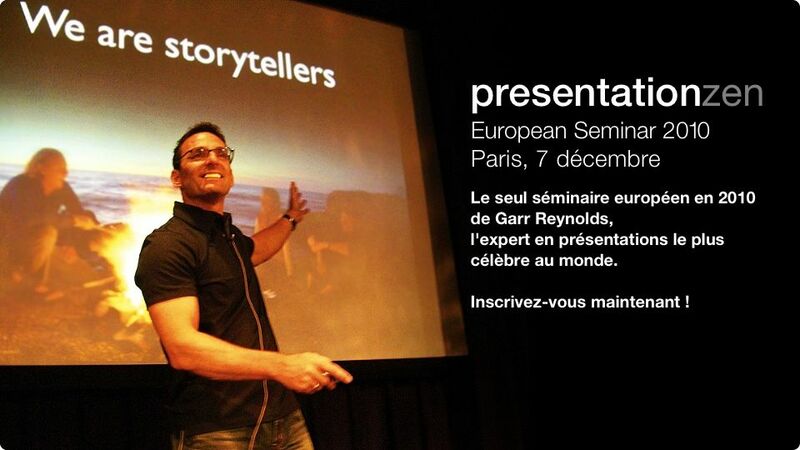 You are here : Blog home » Uncategorized » Why should a freelancer spend €399 to listen to Garr Reynolds? Why should a freelancer spend €399 to listen to Garr Reynolds? Sound expensive? Should you keep the cash for a rainy day? How much does losing a client pitch cost you? You busted your chops taking a good client brief, constructing a top-flight proposal, proving your expertise and added value. Be it due to nerves, a poorly designed PowerPoint presentation, or an inability to dazzle your client with expert delivery, you lost the project. How much does freezing up at networking events cost you? By an amazing stroke of luck, you’ve won an invitation to one of TED‘s annual conferences (a four-digit ticket out of reach of most freelancers!) where you may get the chance to meet the professional you most admire. Are you going to blow it with a lame answer such as: I’m a software programmer, I’m a web copywriter, I’m a translator, I, uh, am a business consultant? How much can boosting your own presentation training expertise bring you? I’m a firm believer in continual professional development. The presentation skills workshops I run train clients to deliver top-notch presentations to cross-cultural audiences by honing their verbal and non-verbal communication styles. I need to spruce up my pedagogical approach to helping my clients also organize, prepare, and design killer presentations. Beyond Bullet Points and its PowerPoint add-in have not proven ideal tools for me in a workshop setting. How much can perfecting your ability to craft compelling presentations for clients bring you? Whether you are a copywriter, a marketing or business development consultant, or a translator, clients rely on you to get their message across in a compelling and meaningful way. How many horrendous PowerPoint presentations have landed on your desk? How many times has a client insisted you add another 5 lines of text on a carefully designed slide? How many times have you sat in a meeting and ignored the speaker because you were too busy trying to read all the small print projected onto the wall? You’re a pro and you’ve got talent. Even an innate gift takes work to perfect. To stay fresh. To adapt to new technologies and new modes of communication. To keep learning. To have the guts to tell your client he or she hired a cutting-edge pro who has trained with leaders for a reason. To be the trusted advisor you are. Invest in yourself, it pays. Investing your hard-earned money in perfecting your skills pays off. Selecting top venues is also a smart networking opportunity: you can meet like-minded professionals who believe paying top dollar for stellar services is a wise business investment. And aren’t those the types of clients and colleagues you want to work with? I’ll let you know after December 7, 2010 the value of this investment. Since you wrote nothing, I assume you felt the presentation and value of your investment was nothing. You are absolutely right, Mai, to call me on the fact I did not, in this specific thread, come back to post an about the benefits I gained. Mea culpa. But if you’ve read other articles on this blog, you’ll have noticed it is a topic that has come up again several times. I’ve bought all of Garr’s books and attended another of his sessions in Europe. My PPT presentations have radically changed (and been massively improved) as a result and I am more equipped to support my clients’ efforts and goals too. As a semi-pro photographer, I’ve always been convinced that words and images are inseparable. Continuing to photograph, to search for suitable images, and to keep abreast of visual trends (such as attending Getty’s Visual Trends 2015 Workshop this month in Paris) supports and amplifies what I gained from this 2010 session with Garr.